Remoting offers developers many ways to customize the communications process, for efficiency, security, performance and power, and allows seamless integration of components running on several computers into a single application. 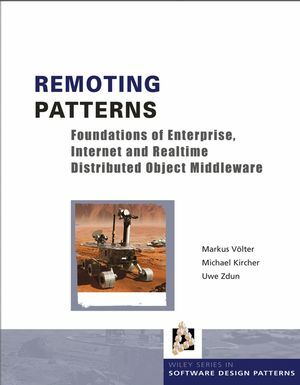 This book exposes the full power of remoting to developers working in mixed platform environments in a way that will ensure they have a deep understanding of what remoting is capable of, and how they can make it work the way they want. Markus Völter works as an independent consultant on software technology and engineering based in Heidenheim, Germany. His primary focus is software architecture and patterns, middleware and model-driven software development. Markus has consulted and coached in many different domains, such as banking, health care, e-business, telematics, astronomy, and automotive embedded systems, in projects ranging from 5 to150 developers. Markus is also a regular speaker at international conferences on software technology and object orientation. Among others, he has given talks and tutorials at ECOOP, OOPSLA, OOP, OT, JAOO and GPCE. Markus has published patterns at various PLoP conferences and writes articles for various magazines on topics that he finds interesting. He is also Co-author of the book Server Component Patterns, which is - just like the book you are currently reading - part of the Wiley series in Software Design Patterns. When not dealing with software, Markus enjoys cross-country flying in the skies over southern Germany in his glider. Michael Kircher is working currently as Senior software Engineer at Siemens AG Corporate Technology in Munich, Germany. His main fields of interest include distributed object computing, software architecture, patterns, agile methodologies, and management of knowledge workers in innovative environments. He has been involved in many projects as a consultant and developer within various Siemens business areas, building software for distributed systems. Among these were the development of software for UMTS base stations, toll systems, postal automation systems, and operation and maintenance software for industry and telecommunication systems. In recent years Michael has published papers at numerous conferences on topics such as patterns, software architecture for distributed systems, and eXtreme Programming, and has organized several workshops at conferences such as OOPSLA and EuroPLoP. He is also co-author of the book Pattern-Oriented Software Architecture, Volume 3: Patterns for Resource Management. In his spare time Michael likes to combine family life with enjoying nature, engaging in sports, or just watching wildlife. Uwe Zdun is working currently as an assistant professor in the Department of Information Systems at the Vienna University of Economics and Business Administration. He received his Doctoral degree from the University of Essen in 2002, where he worked from 1999 to 2002 as research assistant in the software specification group. His research interests include software patterns, scripting, object-orientation, software architecture, and Web engineering. Uwe has been involved as a consultant and developer in many software projects. He is author of a number of open-source software systems, including Extended Object Tcl (XOTcl), ActiWeb, Frag, and Leela, as well as many other open-source and industrial software systems. In recent years he has published in numerous conferences and journals, and co-organized a number of workshops at conferences such as EuroPLoP, CHI, and OOPSLA. He enjoys hiking, biking, pool, and guitar playing. 1. Introduction to Distributed Systems. 10. .NET Remoting Technology Projection. 11. Web Services Technology Projection. 13. Related Concepts, Technologies, and Patterns. Appendix: Extending AOP Frameworks for Remoting.